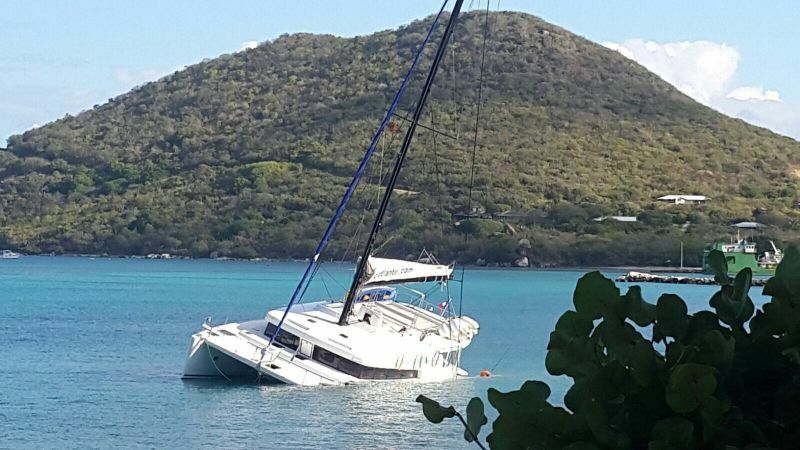 And according to Coordinator of Virgin Islands Search and Rescue (VISAR) J. Phil Aspinall, the boat was actually taking in water and the captain deliberately took the vessel to the shallow area as a result. “The boat was taking on water and he (captain) stopped it there to save himself before he sank. So he didn’t hit anything there at all. He was already sinking apparently. He knew the territory and he chose to go there and sink in safe water…” Mr Aspinall told our newsroom. All the passengers on board the vessel were unharmed and have since departed for St Martin while the skipper stayed behind to find out what went wrong with his boat, according to information reaching this news site. The boat was salvaged and taken to Nanny Cay boatyard. What reportedly seems to be a frequent occurance in that area, a charter yacht grounded and began to take in water off Fischer's Cove, Virgin Gorda on Sunday, February 26, 2017. From all accounts, no one was hurt. It is unclear at this time how the vessel ended up in that shallow area. Virgin Islands Search and Rescue Coordinator J. Phil Aspinall could not give any details when contacted but said vessels grounding in that area has been frequent. He said the area is shallow to the extent that persons often walk to shore. "Groundings happen that side in Fischer's Cove all the time. It's a regular thing. It's on the chart but people just miss it," Mr Aspinall said. My experience is that the C&I people in VG are generally polite and pleasant to deal with as opposed to their counterparts in Tortola who unfortunately can be counted on for rudeness and surliness. It was moved by Husky the same day by lunch time. @ janey: had that been one-of-the-boys the PoPo would have all over looking for product(just saying).....what a country!!!!! The weather is unstable at this moment and really kicking up a storm as it seems there is a disturbance somewhere out there where any and everything can happen but this boat coming from St.Martin ran aground and another also coming from St Martin heading to Guadeloupe crash into the rocks in the area of Mansion in St Kitts. I do hope all is fair in both the weather and the correct reporting as it seems as too many contrabands keep washing up on shores lately also.When will this stop? and take ten miles away to a haul out at Nanny Cay. Passenger flew back to St Maarten captain stay behind. Who was the passengers again? Some things does not add up more in the motar than the pesel for sure. The boat is way too wide to get hauled at VG.